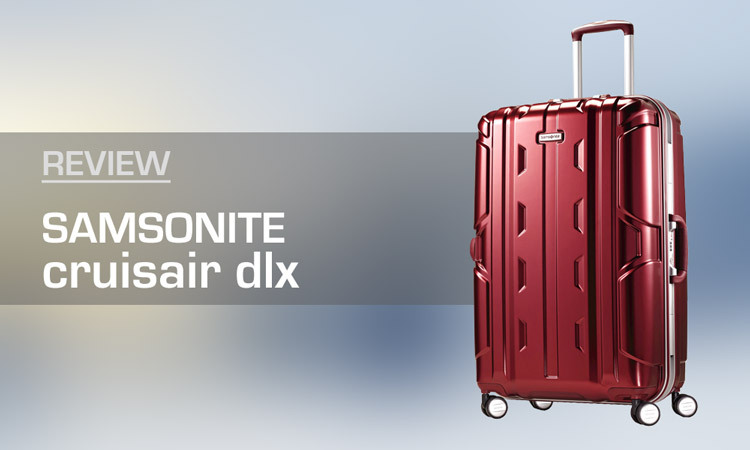 The Samsonite Cruisair DLX is a piece of luggage that is properly named as it cruises with ease and is light as air. Durability coupled with a smart design makes this lightweight suitcase a great buy. The zipperless snap closure along with other features allow it to live up to the Samsonite reputation for quality innovative luggage. Read on to find out why this Samsonite Cruisair DLX case is worth of an A grade. 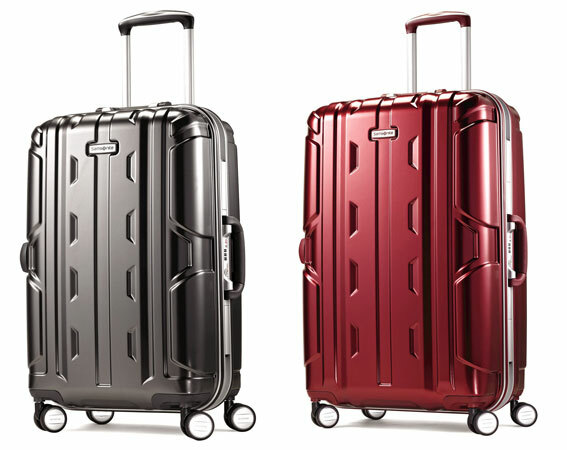 The Samsonite Cruisair DLX is one of a few lightweight suitcases from Samsonite that is made from 100% polycarbonate. Which means not only is it light, it’s also quite durable. Rugged in appearance and form, this case is constructed to form a combination of strength, flexibility, and capacity. The frame is made to be secure. No zippers on this exterior, rather it’s got a tight locking frame that snaps shut. This zipperless design makes it much quicker to pop the lock on the frame than it is to unzip a typical suitcase. Also, there is a rubber seal on both the top and bottom shell, so when it’s closed it is fully protected from water. Not having zippers, the usual TSA lock has been replaced with one more similar to those on a briefcase. This actually keeps your belongings more safe, because it’s not as easy to pry or cut open for thieves or smugglers. The Samsonite Cruisair DLX has a smooth with raised waves. Not only does this add a stylish and rugged flare but, more importantly, the waves are crafted to enhance durability. There will be scratches, just like any hardside case, but they will likely be easier to buff out. 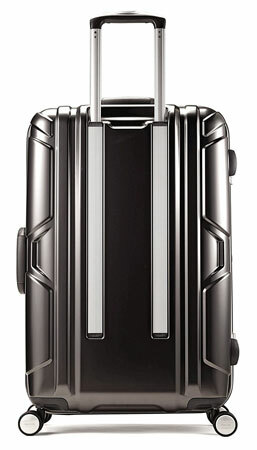 This hardside is properly named with “cruis” in it’s title as this luggage cruises with ease on it’s high grade spinner wheels that turn the case in 360 degrees. The two stage locking telescoping handle pops up with ease along with a top and side spring loaded handle. The Cruisair DLX can be bought in two great looking colors. Anthracite, is the first color. Basically that word refers to “hard coal”. Translation; shiny, dark, grayish silver. I like it, sort of reminds me of the color pewter, or like slate shade. The second color is Burgundy. It’s a little lighter than true Burgundy to me. More like dark red. This also looks trendy, but with a sort of classic mature flare. 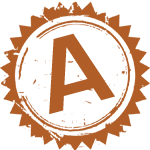 Either way, both colors are noticeable but in an understated way. They aren’t too loud. 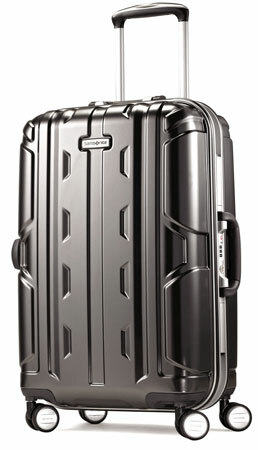 The Samsonite Cruisair DLX 26″ is ideal for 4-7 day trips. It’s got plenty of space internally, with a simple split opening case design. 50/50 packing space allows for even weight distribution. One side is equipped with a pocketed divider which is excellent for separating dirty or damp clothes. The pocket on the divider runs the width of the case and is a great place to store small things, or shoes. Opposite to that is a side with compression straps that snap together with ease keeping your goods nice and taut. Samsonite has really created a superior suitcase by removing the zipper exteriorly. Along with making it wobble less than standard clam-shell suitcases held together with a zipper, it most importantly keeps all of your valuables completely dry in the rain. And even if you have never been caught in the rain with your luggage, you have probably had it arrive in baggage claim wet from when it was unloaded in the rain. Inside the Samsonite Cruisair DLX you’ll find your clothing and contents, safe, sound and dry. The Samsonite Cruisair Bold model comes in 2 additional sizes, besides the 26″ that I am reviewing – a carry-on 21″ and medium 28″ size. To me this is an important factor, as I like to have a matching set. Everyone knows Samsonite is all about strong, durable luggage. It’s what they’ve built their brand and reputation around. And of course, with the Samsonite Cruiseair DLX model, they have boldly delivered on this reputation. 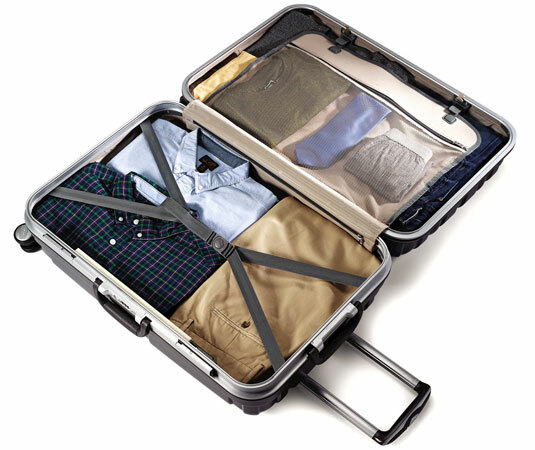 Ridges, or ribs, across the front of the suitcase help reduce bowing when heavy objects are placed on top of it. Users report that this case has survived even the toughest of flights. One user said it’s made several trips to Africa and has come home with just minor cosmetic damage. As someone who lived in Africa for 2 years, I can tell you that is a real accomplishment! Add to this a solid handle and dual spinner wheels, and a sound TSA combination lock, the Cruiseair DLX is designed to last and look presentable for years. The MSRP of the Cruisair DLX 26″ Spinner is $249 currently, but many days you can snag it on Amazon for just around $150. For me, I feel this is a great price (when on sale) for a product that will most likely withstand years of use. Samsonite has more expensive models to choose from, so this is nice mid-range option while still getting the Samsonite brand and durability. A few dollars, don’t fret. The Cruisair DLX is a piece I don’t think you’ll regret. User reviews on various websites average around 4.3 stars out of 5. This is one tough bag that’s well crafted to keep up with even rigorous trips. Scratches are also a problem with hardside luggage, but many users have reported they can be easily buffed, cleaned, and polished. The zipperless design along with harside aluminum material make this case easy to clean, repels water and keeps all your valuables safe. Smooth hardside luggage like the Cruisair DLX may initially get more scuffs, but these can typically be rubbed off easier. Anyhow, this luggage is not meant to be a show piece rather it’s meant to keep our belongings safe and undamaged even on tough journeys. The Samsonite Cruisair DLX can be found just a click away Amazon.